This article first appeared on mig5's blog on 28th October, 2009. It's the million dollar question. And it's rarely been answered because it's so darn hard to do so. Today I'd like to tell you how I do it with my favourite deployment weapons: Aegir, Version control, and Drush Make. This'll be a rather low-level article designed for power-users. For a more high-level overview of the benefits described, check out the recent blog post by Development Seed. 2) The transition of updates through version control to the site can be a royal PITA. Recently 1) has pretty much been conquered thanks to Features, which provides the ability to export the 'mechanics' of a Drupal site from the database into module-like code, which can then be version-controlled. Adrian Rossouw covered how Features can help solve the classic Dev / Stage / Production workflow problem in a great blog post. Features is one of those big guns we've all been waiting for. I mean, google 'development live workflow', and it's this post that is number 1. With the rising popularity of the Aegir hosting system, and its ability to fire off sites like a proverbial machine gun, the other question is becoming even more important. Because Aegir is this fantastic system for managing your sites, right? Of course, I would say that. But how can you keep a site under version control when Aegir's capable of making and manipulating sites almost on-the-fly with the click of a button? The answer has come in the form of Drush Make, which provides an extension to Drush, the command line tool I often refer to as 'apt-get' for Drupal. What Drush Make does, is through the implementation of flat files (similar in appearance to .info files from modules), provide a mechanism to fetch data from practically any source you tell it to, and do $stuff. Sure, you say, that's great. It's basically doing batch drush dl's with some extra features/protocols thrown in. But how does this help with version control? Not only that, but how is that going to help keep this stuff under control while managing the site in Aegir? Certainly for me, much of the issue has been that Aegir is inherently 'on the fly' with its actions. It has no concept of version control. But eventually I realised I had to stop expecting Aegir to handle this aspect, and realise that I could work with it by bringing version-controlled data to it for processing. Or, put another way, I realised the very act of moving data around, does not need to be a version-control procedure in itself. One must start to think like Aegir: and that is that the Platform and its application is the important data, that needs to be controlled. The site is just an instance of the application, and so long as your application is controlled, your site can be manipulated as an instance of it. It helps to think of install profiles as applications, and sites as instances of those applications. If you can grasp that, you're on the home stretch already. The Platform becomes the Platform Build. One of the concepts I struggle with the most when training users on Aegir, is that of the 'Platform'. 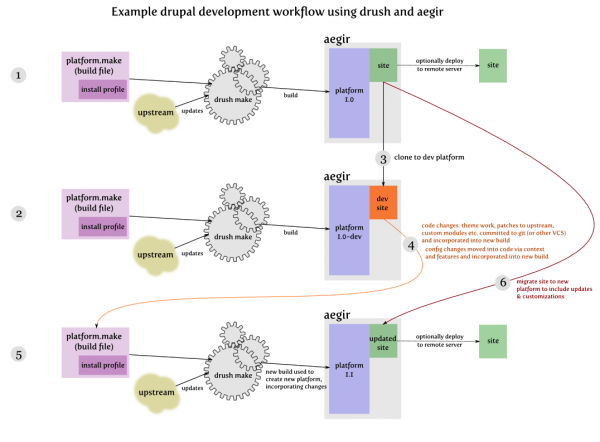 It turns out that many developers haven't been using Drupal's multisite design even prior to Aegir, despite the fact that the design's been around forever. So the idea of having multiple sites inside the /sites/ folder of Drupal core - in other words, sharing the core codebase between sites - is somehow (often, but not always) already enough of a paradigm shift. 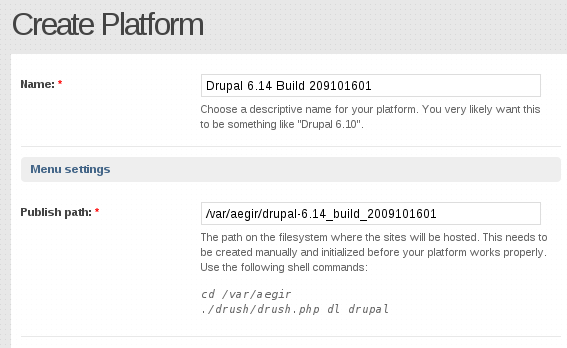 In Aegir, one creates Platforms, which are just code bases, or a copy of Drupal core (or Open Atrium, etc). Only then can we create and manage Sites, which live on Platforms. What makes this hard is that some users are still getting used to this idea, even though Aegir isn't doing anything different here. It's just exposing that multisite design of Drupal, by making it easier. If you can grasp the idea of multisite, you'll find it easier to understand how Aegir works with your sites, and how a workflow can be developed to handle build management. I mentioned Drush Make, and it's ability to grab the Drupal core. And I mentioned shifting one's mindset to think of Install profiles as just 'Profiles', or 'Applications', and sites as instances of those Applications. My install profile or 'application' is the git repo that I'm cloning. Note the branch reference: after Drush_make 'git clone's it, it'll check out a specific branch, or 'build'. This is how this release is different from past and future builds: it's a specific release I'm building for. Suddenly with this one execution of a single flat file, you've built a copy of Drupal core, and dropped in the profile or 'application' into its /profiles/ directory. That's a platform in Aegir's eyes, and not just any platform: but what I call a 'Platform build'. It's a specific release of a your application, right from the top of core, down to the last css file of your site's theme. Yes, in the makefile above, I'm only grabbing the core and my install profile application. Here's the secret: it turns out Drush Make has a recursive nature! I tuck away another makefile inside my install profile repo, called mig5_net.make, and this is the real gem. What we have here is a series of contrib modules from drupal.org. Also I have a slightly hacked version of singular (css stuff), so I don't use Development Seed's feature server repo to grab this: I keep my own copy in my own git server. However, I *do* use the Tao base theme from their feature server, because I know, like contrib, I don't make any changes to it. ; Explicit versions specified to ensure patches apply cleanly. ...just so you don't think I'm making this stuff up :) Yes, such features exist, and are in active use! So, this make file gets downloaded when the install profile git repo gets cloned and the build-specific branch is checked out. While Drush Make grabs the profile from the first makefile (I call it the .build file), it scans the directory and finds this make file, and recursively executes it - thus grabbing all the site-specific components in the process. Suddenly what I have is the entire platform, complete with any updated components I made in the makefile of that specific branch in git. At this point, I just have to tell Aegir about it! Aegir goes and checks the platform, learns about it, adds the package information it finds within it to its database, and if all's well, gives me the big green tick. But where's the settings.php? The site files? This isn't actually the *site*! Exactly. It's only the application that we've built, and it's only the application we store in version control and generate with makefiles. The site still exists on the old platform, and Aegir knows it does. What we have to do here is stop thinking of the /sites/www.mig5.net/settings.php etc as the *site*, but rather, the current running 'instance' of the application. It sounds a bit weird, doesn't it? But you don't realise, if you're already using Aegir, you're already probably doing this already. 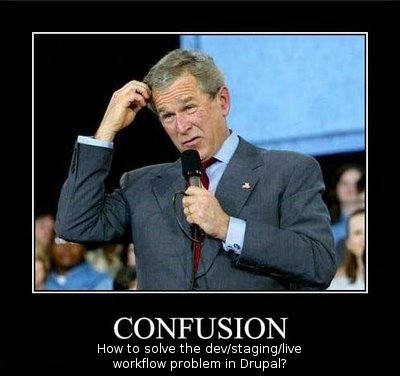 Drupal 6.14 came out recently, and your sites were on 6.13. You built a new platform (6.14, by downloading it), told Aegir about it, and you used the Migrate task to upgrade all your 6.13 sites to 6.14 at the click of a button. We're doing exactly the same thing here: you've got your new platform, with your updates. Now you just need to Migrate the site onto that new build. Your settings.php and files from /sites/www.mig5.net/ get carried across to the new build, and any component code/database updates will get applied in the process. you did that last one via Aegir, which means you were protected with the rollback functionality of Provision and Drush, meaning if it all went pear-shaped, you'd be back on the previous release as though nothing had happened. This is how Aegir can cooperate with version control: all it needs from you is to get that Platform, or build, in place, so it can use it and take care of the release process for you. And while it used to be difficult to build an entire distribution complete with all the nitty gritty components required, it's now never been easier to do this step in a matter of seconds, because Drush Make does this job for you. This application, www.mig5.net, is literally two files in my git repository, plus the theme (I hacked on Young Hahn's Singular theme a bit). The two files are the install profile itself (which, of course, I only ever once: first time install of the site) and the mig5_net.make file, that does everything else. Use the 'Clone' feature to clone your current Live site to the test build. Commit those changes back to the repo (the theme changes, maybe adding that new module as a ''project' in your drush_make file inside your install profile). Make a branch of the repo in preparation for a new live build. The recent changes to Drush Make include bringing it in line with changes in the also-recently-released Drush 2.1, adding support for checking out git branches after a git clone, and supporting absolute paths for destination of builds on the server. Need to play with it some more to try it out? You can see examples of my 'build' makefiles in my git repo as well as my application install profile for mig5.net, which contains the 'bigger' drush_make file. Or check out the Managing News install profile and its make file - it's the first project other than Aegir to use a make file to build itself. If you're new to Aegir, Drush and Drush make, I hope this article gives you the incentive to try it out and see why it rocks. If you're using Aegir and Drush already, I hope Drush Make makes more sense now, and that this gives you that 'ah hah!' moment if you've been scratching your head about how to handle build management in an Aegir environment.